Add custom sidebars to Publisher theme. 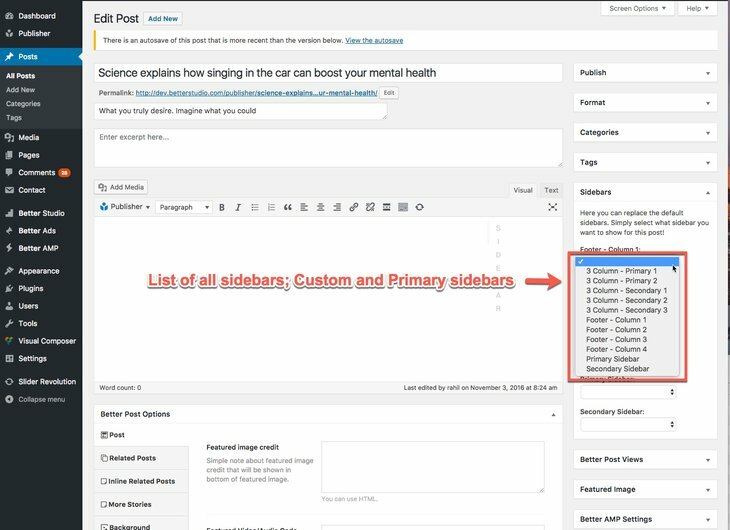 “Custom Sidebars” plugin for customizing post pages sidebars. You can create as many as custom sidebars you want in Publisher and use them in different pages. “Custom Sidebars” plugin is fully compatible with Publisher. 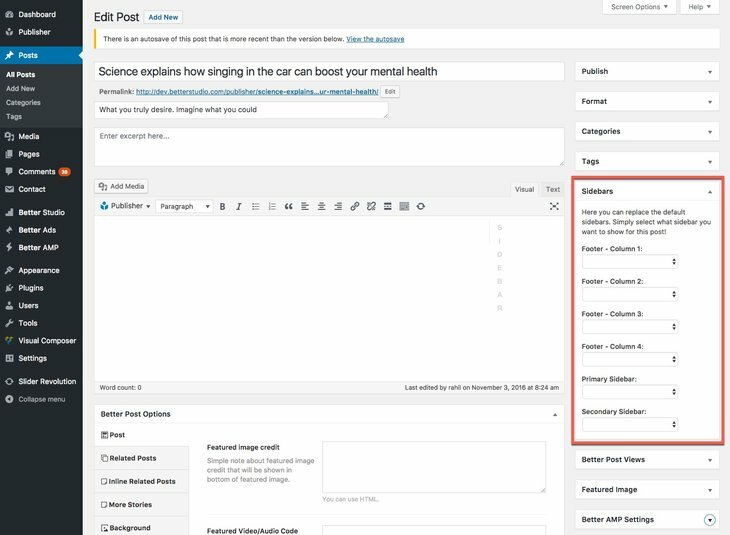 Its task is to customize sidebars appearing on every single post you want (any post type – read more about post types post types). 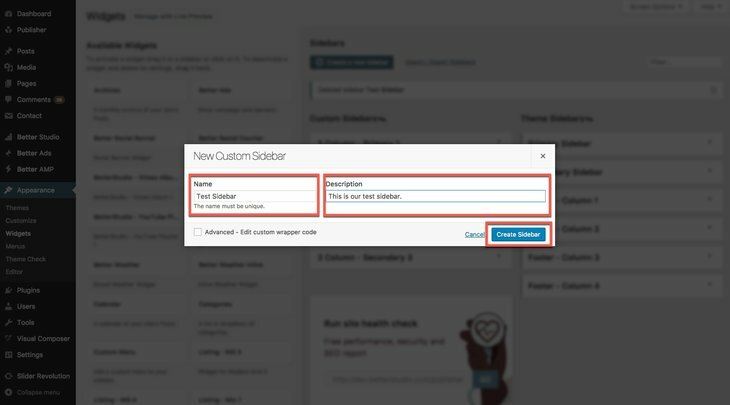 Now we first describe how to create custom sidebars in Publisher then describe how to manage sidebars in different pages by “Visual Composer” and “Custom Sidebars” plugins. How to Create Custom Sidebar? 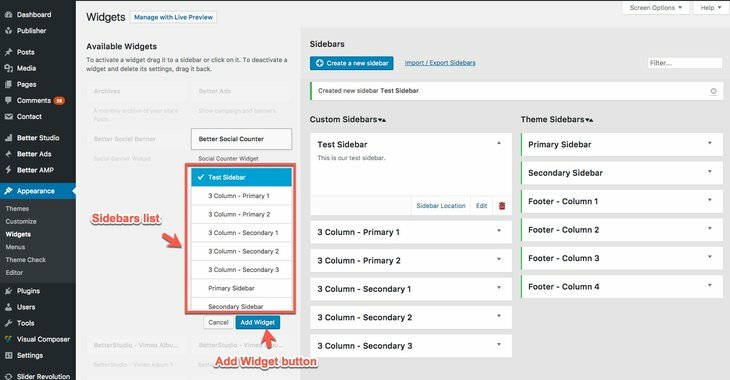 Make sure Custom Sidebar plugin is activated on your website. First of all you should create a sidebar. But how? in this part we teach you how to create a sidebar and in the next part we introduce Publisher exclusive widgets. Go to Appearance → Widgets. Available Widgets: These are widgets you can select for your sidebar. There are 35 exclusive widgets for Publisher. 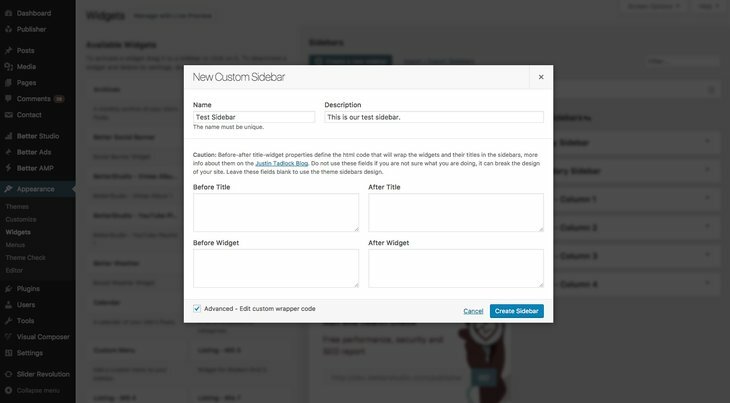 Create a new sidebar: Use this button to create a new sidebar (we will describe it). Import/Export Sidebars: You can take a backup of your sidebars or restore backups created before. Custom Sidebars: These are sidebars made by user, could be deleted or add more of them. Theme Sidebars: These are default sidebars of Publisher. It’s obvious where they belong to. Primary sidebar is used in 2 column layout and both Primary Sidebar & Secondary Sidebar are used in 3 column layout (Read more about layouts). There are four widget locations in footer (Read more about footer options). Ok get back to create a new sidebar. 1- Click on Create a new sidebar (see above image). 2- Enter a name for sidebar in Name field. Enter a description in Description field. Finish it by clicking on Create Sidebar. Now you have a new empty sidebar. Before-after title-widget properties define the HTML code that will wrap the widgets and their titles in the sidebars. More info about custom wrapper code. Do not use these fields if you are not sure what they do, it can break the design of your site. Leave these fields blank to use the theme sidebars design. We created a new sidebar in above and will use it here, but the procedure is the same for all new or existing sidebars also for Custom and Primary sidebars. 1- Now you should add widget(s) to your empty sidebar. On the left-side you see the list of available widgets; 35 exclusive widgets for Publisher. Click on the widget you want. A list of all sidebars will show up. Select the sidebar you want to add this widget to. Click Add Widget. 2- Now your widget is added. Open its accordion menu and customize it. As mentioned above, Publisher has 35 exclusive widgets, use them in Custom and Primary Sidebars or use them by Visual Composer. If you want to display weather or your social count or show special posts in various layouts and styles, probably there is an option (or options) suits your need. Because they are too many, we dedicated a section to Publisher Custom Widgets for introducing and describing them. How to Use “Custom Sidebars” Plugin? Footer – Column1 & 2 & 3 & 4: Shown in Footer widget locations (Read more about footer options). 1- Edit the post you want to customize its sidebars. All post types are included i.e post, page, attachment, etc. 2- On the right-hand-side of the editing page you see Custom Sidebars meta box. 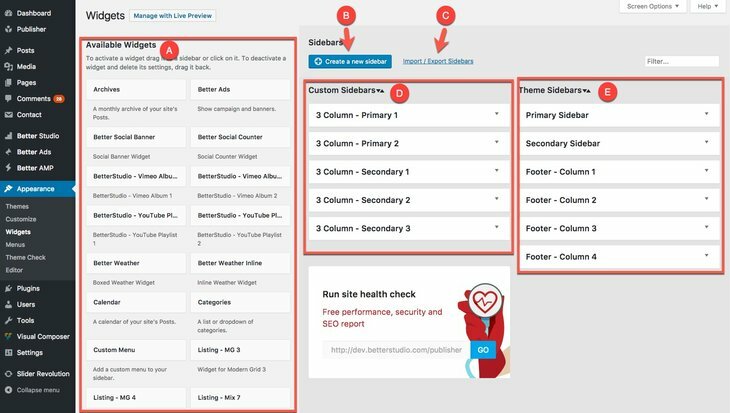 Six locations of Publisher sidebars are shown, but remember displaying sidebars depends on which layout and setting you use for your site (or overridden settings for this post). 3- Below the sidebar location you want to change its content, click on drop down menu. 4- You see a full list of Custom and Primary sidebars in Publisher. Select the sidebar you want. You’re done and this sidebar location is customized (do not forget to update the post). Do the same procedure for every sidebar location you want. 3- Open For Archives accordion. Here you select an archive page for displaying this sidebar. You can set roles for showing one widget; for example show it just in specific pages or for specific users. To do this, when Custom Sidebar plugin is active, you see a button below Global Options, Visibility. Click on it and add a new rule to it. You see it is possible to show this widget for specific roles, specific pages, post types and taxonomies.